With signs that read “Come Down to the Bus Because You Matter”, “Shower Power”, “When We’re Clean We Feel Redeemed” and others, students from The Ronald E. McNair Public School #5 joined forces with Brooklyn Borough President Eric L. Adams in support of a new initiative to bring a mobile shower to the borough of Kings. 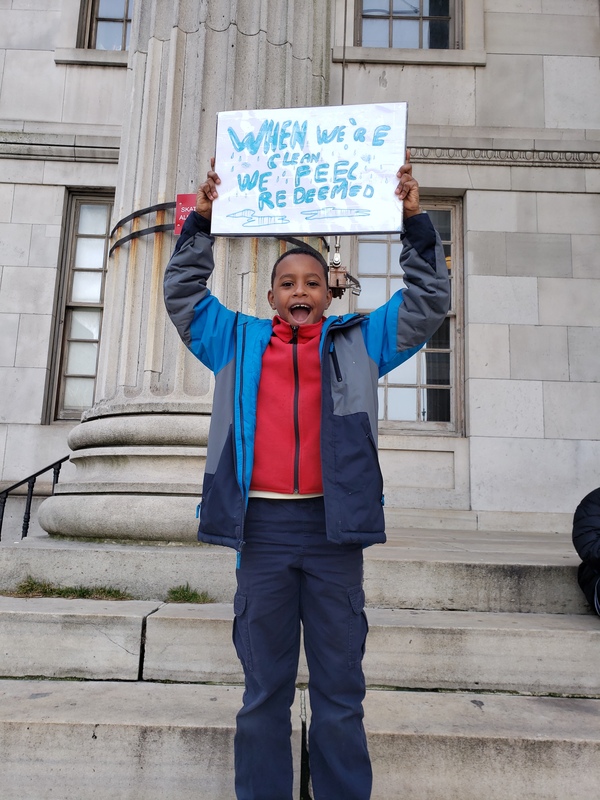 According to PS5’s 5th-grade teacher Cindy VanPetten, as part of their New York State expeditionary learning, reading and writing curriculum on Human Rights, students are exposed to the Declaration of Human Rights. “This usually sparks the children to want to do something in the community,” VanPetten said. After researching the topic, encouraged by Jada Warren and Serenity Dixon the class contacted to Borough President to show support in having a shower bus for Brooklyn. Students hope to join Brooklyn Community Service (BCS) and BP Eric L. Adams in welcoming the shower bus when it arrives. According to BCS COO Jodi Querbach, who attended the meeting and met with the children earlier, the bus is in production and anticipated to be delivered around June. “We also like to give them the books we collected as part of our student-run book store and read to them while they wait on line,” said Jada Warren. “I’m sure they would appreciate that,” chimed in BP Adams. Next articleDo You Know an Unsung Hero?